The Database Editor is a free Ignition project that enables you to create database schemas (create/alter/delete database tables) and add/edit/delete data in your database tables. It provides a nice graphical user interface to do these things. The Database Editor is free for use but not for modification. To make your own changes you must purchase a modification license. If you want us to make changes or improvements or if you have any issues then please tells us about them. The Database Editor supports the editing of date/time fields in the SQL Editor tab. These fields have the format 'yyyy-MM-dd HH:mm:ss'. For example: "2017-07-11 12:33:48". Note that a field will turn red if the format is invalid. An easy way to edit these fields is to double click on one of them and then immediately press enter. This will fill in the current date and time into the field which you can then edit. The datasource dropdown now provides additional information about each datasource configured in Ignition. It shows what kind of database connection, for example MySQL or SQL Server. It also shows which datasources are valid and which one's are faulted or disabled. The Database Editor supports MySQL and now also supports the H2 database from the Database Module. This means that you can create/alter/view/query/edit database tables using Ignition datasources configured in Ignition for MySQL and H2 databases. The Database Editor also supports H2's database compatibility modes. The compatibility modes make H2 more compatible with other database systems. H2 has compatibility modes for MySQL, Microsoft SQL Server, PostgreSQL, Oracle, DB2 and others. 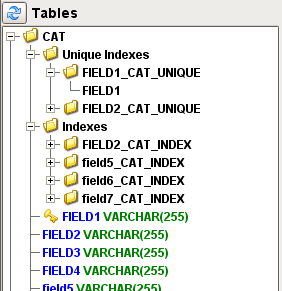 In the MySQL compatibility mode all field names and table name are in lower case and are case insensitive and the backtick '`' character is used around field and table names. In SQL Server mode the characters '[' and ']' are used around field and table names and the '+' character is used for string concatenation. More information about compatibility modes can be seen in H2 documentation. Indexes on database tables are now displayed in the tree of tables. The Database Editor can’t be edited without a modification license. If you try you will get a popup message saying that the project has been modified and a modification license is needed. Once a modification license is purchased an editable version of the project is given. In the SQL Data Editor window users can add new rows, edit cells, and delete rows from database tables. But this can only be done if primary key columns are shown in the Results Table. The primary key columns are used in queries to update and delete rows. Always look at the error messages to see if you can determine what the problem is.